Back in 2014, the AIA Center for Architecture put on an exhibition entitled “Considering the Quake: Seismic Design on the Edge”, exploring how the specifics of earthquake engineering can be merged with contemporary architectural forms. New buildings like OMA’s Taipei Performing Arts Center, Libeskind’s Contemporary Jewish Museum in San Francisco and Singapore/Tokyo-based Studio SKLIM’s earthquake-resistant Hansha Reflection house were examined to see how different contemporary building methods and structural systems can provide new structures with protection from earthquake activity. 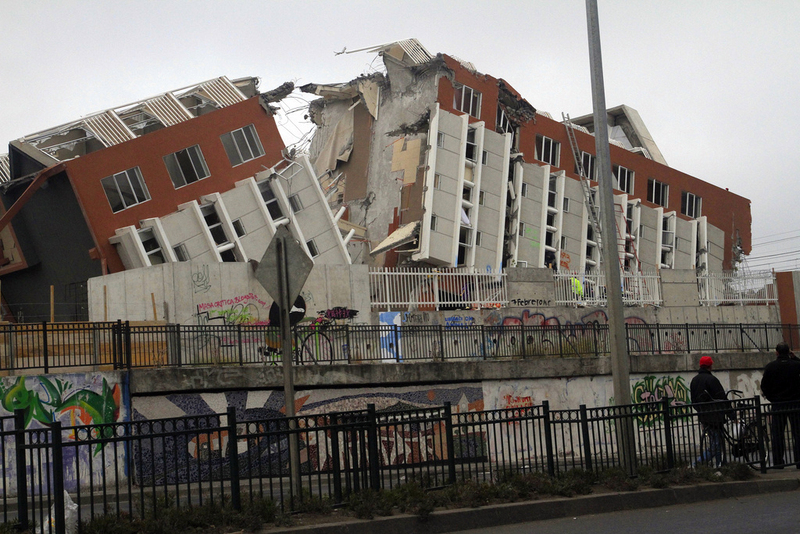 Inciting a larger dialogue about the ways in which engineering and architecture can be employed to provide a buffer from seismic events is constantly relevant. Some of the world’s largest metro areas — including Tokyo, Jakarta, Shanghai, and Los Angeles — are all located within highly active seismic regions, with the potential to cause destruction to millions. The principles of seismic design and structural engineering for earthquakes include base-isolating structures, tuned-mass dampers, lightweight construction materials, and reinforced foundations to absorb shock waves. With many architects already designing new structures in earthquake-prone metro areas, the following buildings incorporate engineering principles and support systems that blend contemporary design with seismic-sensitive principles. Unlike the innumerable glass and steel skyscrapers built in China’s urban areas over the last couple decades, the decorative red mud brick screen that envelopes A House For All Seasons represents a decidedly rural take on new construction in Shaanxi Province by looking to traditional building techniques. However, the brick structure does more than provide a vernacular aesthetic; a concrete column and roof structure is combined with mud brick infill walls, creating a new hybrid that satisfies criteria for earthquake resistance. Situated on top of a V-shaped concrete foundation, the Television House sits weightlessly above the ground — 1.5 meters, in fact. This robust foundation was specially designed as an earthquake absorbing unit, creating a durable home with a sleek industrial design capable of resisting the seismic activity of Osaka Prefecture. While the San Francisco Bay metro region is renowned for its relaxed lifestyle, enviable climate, and unsurpassed scenery, the area also experiences frequent earthquakes — a fact that Fougeron Architecture had to take into consideration when designing the 440 House. A reinterpretation of California’s midcentury modernism, the house’s exposed steel moment frame is made of thin columns and beams, providing lateral support during an earthquake and expressing the home’s presence in an active seismic zone. Rafael Vinoly’s 80,000-square-foot stem cell and developmental biology research center is a feat of science and engineering. The horizontally oriented science building sits high off the site’s steep slope, supported by space trusses that rest on concrete piers, acting as a seismic base isolation system to absorb earthquake forces while promoting greater connectivity across campus departments. To reinforce the “stacked-tray” SA.house against Tokyo’s seismic activity, atelierA5 installed iron plate braces in the back of the each floor’s spandrel walls and built-in furniture. Since the necessity for earthquake resistance is reduced on the upper floors, the height of each level’s spandrel wall vary to afford privacy from the street. While the diagonal beams slice the geometric grid of Steven Holl’s residential towers in Chengdu, they also help to brace the buildings in the event of an earthquake by providing extra support. The white concrete structures also incorporate geothermal heating and cooling, as well as rainwater collection systems to create a new icon for the city. Besides being built with sustainable features, like alternative heating systems, cantilevered shading systems, and increased ventilation, the Bioclimatic Residence on the outskirts of Athens was also designed to resist the region’s active seismic zone. With a lightweight construction system and a reinforced base, the metallic-paneled house bears an industrial aesthetic, and has the ability to withstand earthquakes.